Plus, the best way to store your sweaters, furs, and bags. Stylist Jamie Lyons and her husband, Brocke, keep a minimalist lifestyle in their Oak Cliff home—even down to the closet, where the couple’s monochromatic aesthetic extends to Jamie’s collection of Céline and The Row. Here, Lyons shares questions she asks herself before buying a new item. 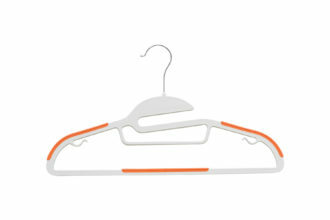 The all-in-one hanger has hooks, rubber grips, a trouser bar, and an accessories compartment. Is there anything about this I would change? Lyons believes it’s worth a little extra searching to make sure you’re filling a spot with just the right thing. Does this fill a gap? Make sure the item fulfills a purpose not already served by another product in your home. Is this replacing something that I currently own? If the answer is yes, be sure to sell or donate the existing item. Even functional items like a toothbrush can illicit an emotional response and exhibit the beauty of good design. “The best way to keep a bag’s shape is to store it upright on a shelf,” says Adrianne White of California Closets. Keep bags filled with wadded paper or the dust cloth it came with. Store clutches in a drawer with clear dividers so you can see them. Proper storage starts with proper washing: handwash inside out in a gentle soap solution. Do not wring. Let drip dry or roll excess water off with a towel. When dry, fold and stack no more than four high on a shelf. Hanging will misshape the garment, says White. White recommends storing furs professionally in a storage facility during warmer months. In winter, hang coats on wide hangers in a closet large enough to avoid crushing the garments together. Avoid sunlight. Start by cleaning with a damp cloth and drying. For long-term storage, stuff with acid-free paper or boot forms. Keep behind doors to avoid dust, says White.